On every job, Rosin Preservation contributes practical rehabilitation strategies and design direction appropriate to the nature and complexity of the project. We guide clients through regulatory processes triggered by local, state and/or national preservation law. By connecting clients to legal and accounting expertise and to tax credit investors, we help to ensure that each rehabilitation project has the most effective team to achieve a successful outcome. Our intimate understanding of the preservation process, the players and the rules and regulations enables our clients to accurately anticipate the time, costs and hurdles required to complete a successful project. Historic tax credits are one of the most effective tools for redeveloping historic properties. The federal government and many state governments offer this financial incentive to property owners who rehabilitate historic buildings in exchange for preserving a building’s key historic elements. The 100-plus tax credit projects in the Rosin Preservation portfolio represent over $1 billion of construction activity and includes a broad spectrum of projects — commercial, institutional, industrial and residential buildings in big cities and in small towns. They range from the $100,000 rehabilitation of a one-story commercial storefront to the rehabilitation of the iconic Empire State Building. The National Register of Historic Places (NR) is the nation’s honor roll for historic buildings, structures, objects and sites. It includes individual landmarks and groups of resources designated as historic districts. 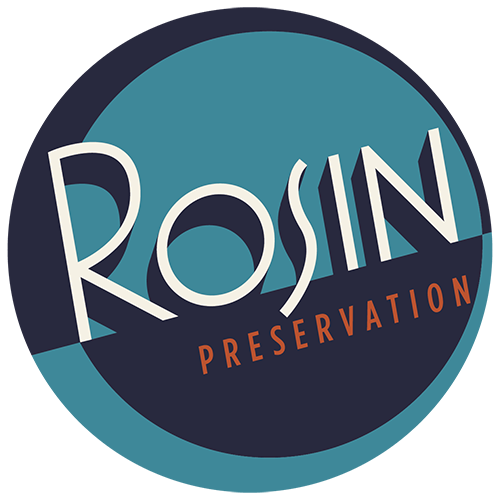 Rosin Preservation has listed dozens of individual properties, historic districts, and multiple property submissions on the NR, giving property owners access to preservation incentives (such as tax credits and grants) and providing direction to planners targeting economic development incentives or guiding new development. Beyond such tangible benefits, we all benefit from a better understanding and appreciation of our common heritage. Rosin Preservation has inventoried and evaluated the historic eligibility of thousands of resources on projects ranging in size from a single building to hundreds of buildings. Some surveys have looked at geographical clusters of resources (such as a downtown commercial district or a residential neighborhood), while others studied resources linked by a common theme (such as theaters). Regardless of size or association, these projects help owners, planners and community leaders understand the physical fabric that tells our shared story. Rosin Preservation participates in a variety of activities that fall under the broad umbrella of planning. Many communities identify historic buildings to help prioritize short-term and long-term efforts and to focus public dollars on strengthening areas of the community that reflect a shared history. Some projects evaluate how a specific federal undertaking will, directly or indirectly, impact historic resources. Other projects anticipate the maintenance issues facing a historic building. Still other projects focus on educating the public about historic resources. In some instances it is not possible to save a historic resource. When possible, before it is demolished, relocated, or otherwise impacted, Rosin Preservation will document the building to ensure that key information about its appearance, construction and history is recorded. Reports prepared for the Historic American Buildings Survey or the Historic American Engineering Record are archived in the Library of Congress. Other documentation reports are maintained by the State Historic Preservation Office.